FCCC chassis offer up to 50° wheel cut to get you in and out of the tightest spaces with extraordinary ease, plus a variety of suspension options to fulfill even the most demanding delivery requirements. For over 70 years, Detroit Diesel Corporation has developed a legacy of reliability and efficient performance. These qualities have been transferred to steer and drive axles, the components that shoulder your load day in and day out. Detroit axles combine advanced design features and state of the art manufacturing processes and are designed specifically for FCCC chassis. 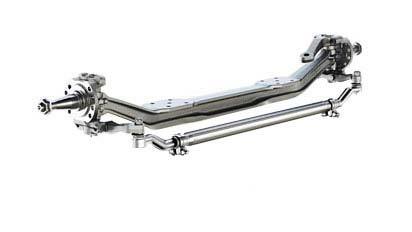 For the tightest turning radius and maximum maneuverability, the unique design of the Detroit steer axles’ I-beam and tie rod arm offer up to a 50° wheel cut. And by using needle bearings that roll against the kingpin instead of bushings that rub, they increase durability while reducing maintenance needs. Enhance mobility for your fleet with Meritor front axles, which offer strength at lighter weights - increasing your payloads and raising your operating efficiencies. 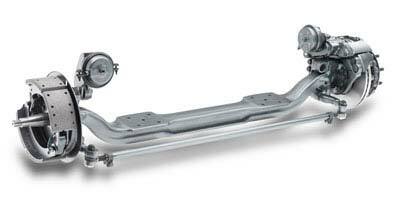 FCCC’s flat-leaf with front sway bar or taper-leaf spring front suspensions, rated up to 10,000 lb., provide a solid, smooth ride. Flat-leaf spring 5,790 – 7,500 lb. 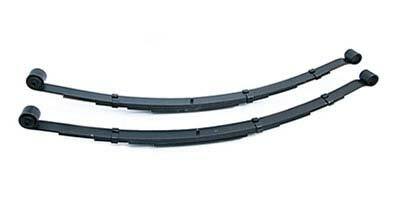 Taper-leaf spring 7,000 – 10,000 lb.